"SEND MY GUARD SQUADRON INTO BATTLE!" The elite guards of the Tarkin Initiative, Imperial death trooper candidates are hand selected from the Stormtrooper Corps by Imperial Intelligence. Trained to be ruthless, efficient, and merciless, they are also rumoured to undergo classified medial augmentation procedures. Miniatures supplied unpainted and require assembly. NOT A COMPLETE GAME. 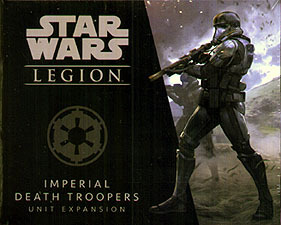 STAR WARS: LEGION CORE SET REQUIRED TO PLAY.